As a designer it is sometimes very difficult to design something for oneself. 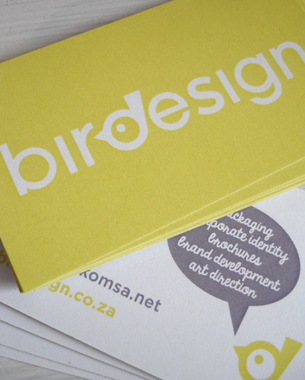 Birdesign developed out of 2 things, a childhood nickname and the convenient fact that it could also be an acronym from ‘branding’, ‘identity’, ‘retail’ and ‘design’. The logo needed to be simple and memorable, with the bird device used independently as a signature when the full logo was not appropriate.